Scroll down to see the program and presenter bios. 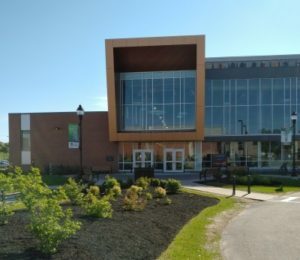 The ASI Forum will be a bilingual event, held at the University of Prince Edward Island, School of Sustainable Design Engineering (south entrance – facing the Bell Aliant Centre). You may park for free in the MacLaughlan Arena parking lot, as well as general lots D, E, A and B (campus map). Exhibits and registration will be in the RBC Concourse of the School of Sustainable Design Engineering building. Registration is between 12:00 – 6:15 pm on Monday, August 20. The Forum will begin promptly at 6:30pm, with an opening ceremony and keynote address that are open to the public. The opening ceremony and plenary sessions will be held in room 128 A/B. Concurrent sessions and workshops will be held in both the School of Sustainable Design Engineering and the nearby Health Sciences building. Click here to view the final program/schedule. Scroll down for descriptions of individual presentations. Artistic Opening Plenary – What is a Whole Society Approach to Promoting the Mental Health of Children and Youth? Video: How can existing frameworks support addressing mental health as a whole society? Opening Panel – Convergence of current frameworks: addressing mental health as a whole society! Panel Discussion – Momentum for working together in Atlantic Canada and beyond! At ASI 2017, participants developed a Call to Action for a whole society approach to promoting child and youth mental health. There has been momentum for action this past year and ASI 2018 will take the work one step further. Mental health promotion is not the responsibility of the health care system alone – it belongs to many sectors. It is imperative that the investment is appreciated for the benefits it will have for other systems and for society as a whole. Working together to promote mental health requires collective thinking and cannot rest solely with government – it will require collaboration with civil society, philanthropic organizations and the business world. So ASI aims to bring these groups together in 2018 to act together! Mounting global evidence shows that mental health is an issue for the entire population requiring a whole society and whole of government approach to make an impact. Evidence tells us we need to start with an investment in children and youth. Much is happening globally that we can apply locally. 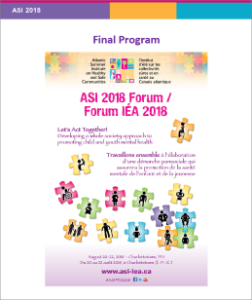 The 2018 ASI program is being designed to build on evidence and expand networks and develop a whole society approach to promoting child and youth mental health in Atlantic Canada. To enhance our collective understanding of the links between mental health and health outcomes with early childhood experiences. To increase understanding of the reciprocal relationships between policies promoting mental health and those that impact community viability & sustainability. To make the connection between global strategies and frameworks and local initiatives. To develop knowledge and skills that can be applied to expand collaboration and networks for action after ASI 2018. To provide an update on ASI 2017 Call to Action and continue the momentum of work.